Finally back from GDC and fully recovered. I didn’t get the GDC flu that seemed to be quite popular this year, but I was incredibly exhausted the first few days back. Lots to report on since the last update (about a month ago! I really need to get better at updating this devlog. Just been super busy). This year’s GDC was very different for me. It’s my third time going. The previous years, I wasn’t showing the game or giving a talk, so GDC was more about meeting other developers and hanging out in Yerba Buena Park. This year, I was showing Manifold Garden at the Day of the Devs exhibit and also giving a talk as part of the level design workshop. It was a ton of work to prepare for both, and during the week of GDC, I had very little time to do anything else. However, both were incredibly positive experiences and I’m very grateful to have been given the opportunity to do both. This year, Double Fine and iam8bit organized an exhibition of several games at GDC called Day of the Devs. It was a fantastic venue – right at the bottom of the escalators in Moscone North. It was a prime location for showing the game, as it was right by the registration area, and you basically passed by it on the way to the expo floor. It was a real honor to be a part of this, and I’m so thankful to Double Fine and iam8bit for this opportunity. 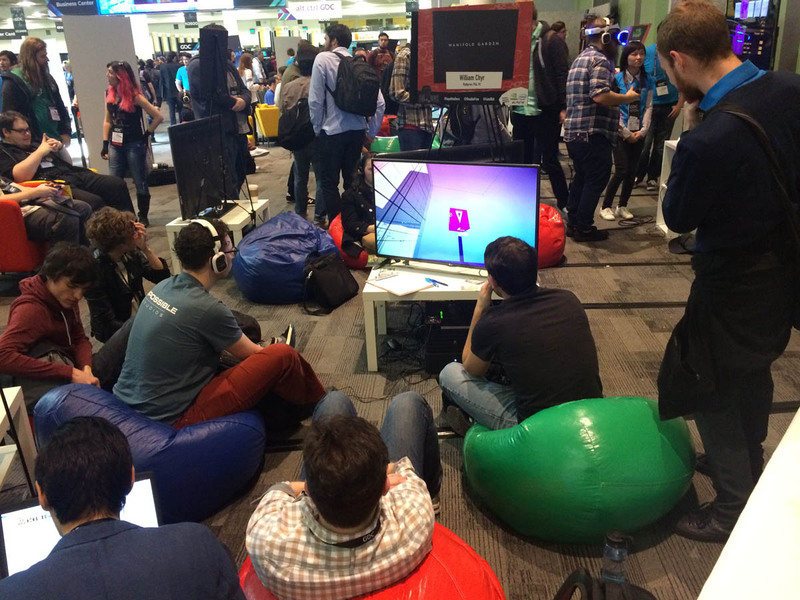 It was my first time showing a game at GDC, and it was great to have a home base where you can chill. In the past, I pretty much just wandered around the convention center. This year, it was really nice to have a comfortable place to sit and chill, and invite people to come and hang out. On Monday, Double Fine also organized an event at the Alamo Drafthouse Theater and San Francisco. They rented out the entire theater, and each of the devs showing their games got to go up on the stage to present for 20 minutes. It was incredible seeing all of the games on the big screen with the sound system. 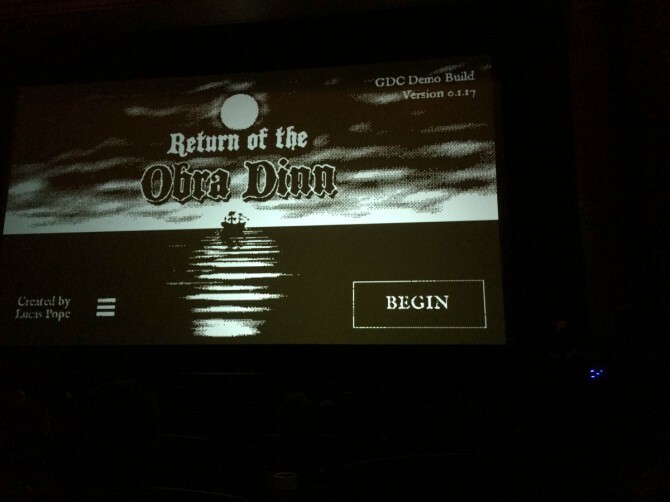 Here’s a pic of Lucas Pope showing how the rendering works in Return of the Obra Dinn (it’s quite dark so you can’t actually see Lucas in the pic). The game looked fantastic on the big screen. This year, I was also invited to give a 30 minute talk as part of the level design workshop. It was actually quite a lot of work to prepare for this, but Joel Burgess, the organizer of the event, made the whole process very smooth. 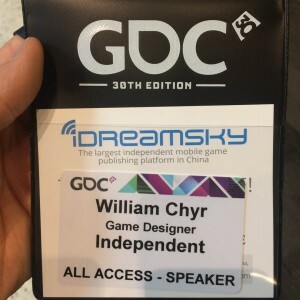 We had to have rough drafts of the talk in several months before GDC, and this meant that when GDC snuck up, I wasn’t caught unprepared and actually had a really strong presentation to work with. I also had a mentor, Liz England, who gave me feedback on the various versions which was very helpful. One thing I did that I found very useful was to record myself giving the talk, and then sending it to people for feedback. This works much better than just sending someone slides, because they don’t know how you plan to use those images to deliver your talk, and it gives them much better sense of your pacing. Liz and Joel both gave me really good feedback based on my video recordings. I also gave a practice talk at the local Chicago Unity meetup, and also did a dry run on my twitch stream (which seemed quite popular – had around 50 viewers that day, when normally I have 20). Anyway, if you ever plan on giving a talk at GDC, definitely know that it will mean a lot of work to prepare. Start making your slides early (as in, around October), practice a lot, and record yourself giving the talk. By the time I went on stage, I actually didn’t feel nervous at all, and the talk went very well. It was also great the the Day of the Devs exhibit was right outside the room where I gave the talk, so I was able to point people to check it out. 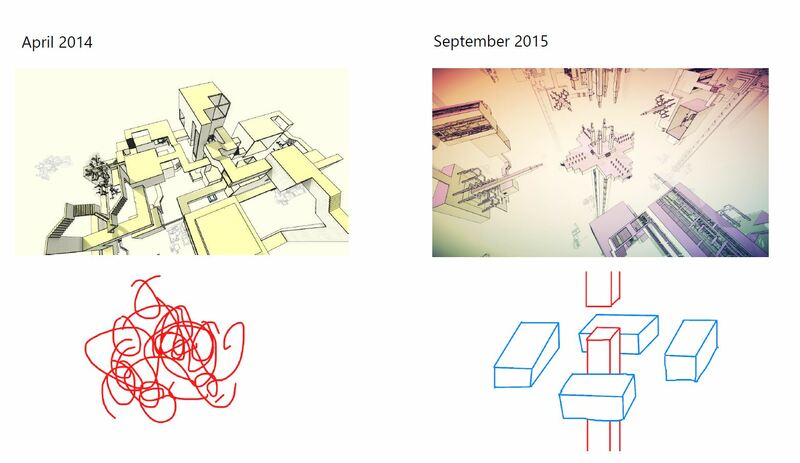 This was useful as Manifold Garden wasn’t out yet, but it allowed people to experience the game. All in all, GDC was very busy this year, but very positive. 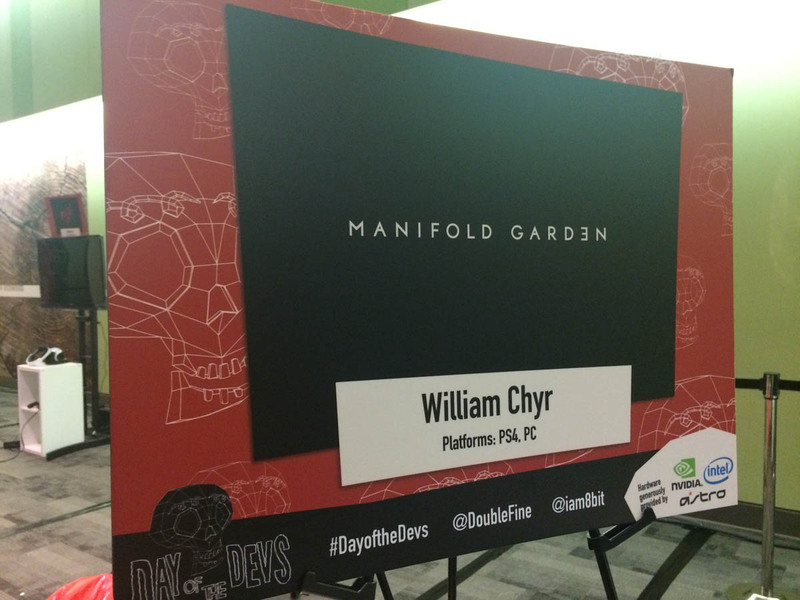 Showing Manifold Garden at Day of the Devs was an incredibly positive experience. A lot of people I talked to were familiar with the game and seemed excited about it. 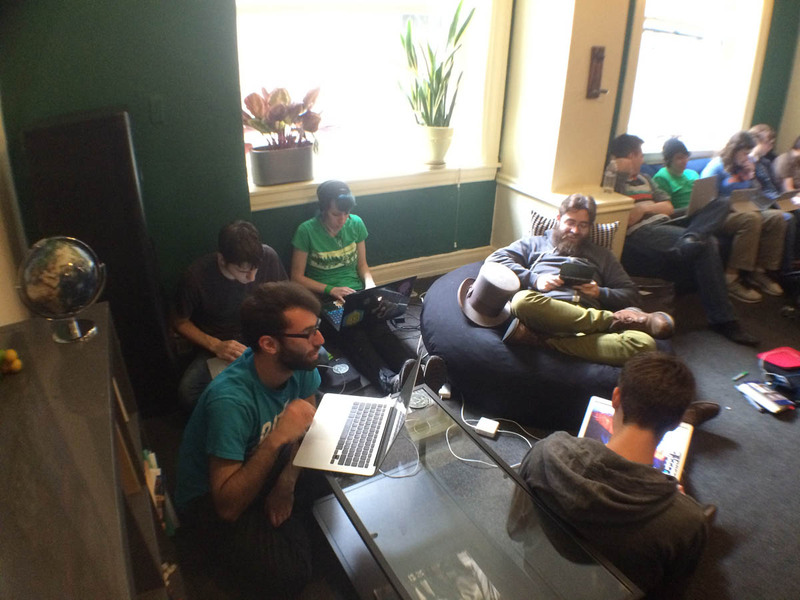 It was such a great feeling to tell people I’m working on “Manifold Garden”, and to see them get excited. And when people didn’t seem to know the name, I’d show them a picture, and they’d say something like “oh ya, I’ve totally seen this game before”. The most common reception I got from people was that they had seen a lot of beautiful pics of the game on twitter, and had no idea what the game was about, but were still excited. I know it’s important not to base feelings on what others are saying, and certainly the crowd at GDC is part of a small bubble of developers, but it was nevertheless a big confidence boost. Some of you might remember two years ago, when I showed the game at PSX in Las Vegas (this was back when it was still known as Relativity), nobody knew about the game and I was super bummed out by that experience. It was almost the complete opposite experience this time around, so it felt super rewarding. There was also an “impossible lunch” meeting. A bunch of guys from UsTwo, the makers of Monument Valley, proposed that devs working on games with impossible geometry meet up for lunch. There was Steve Swink (Scale), Albert Shi (Museum of Simulation Technology), and Marc Ten Bosch (Miegakure), amongst many others. Henry Segerman, a mathematician, also joined us, and showed us a bunch of beautiful 3D prints of mathematical objects that had made. 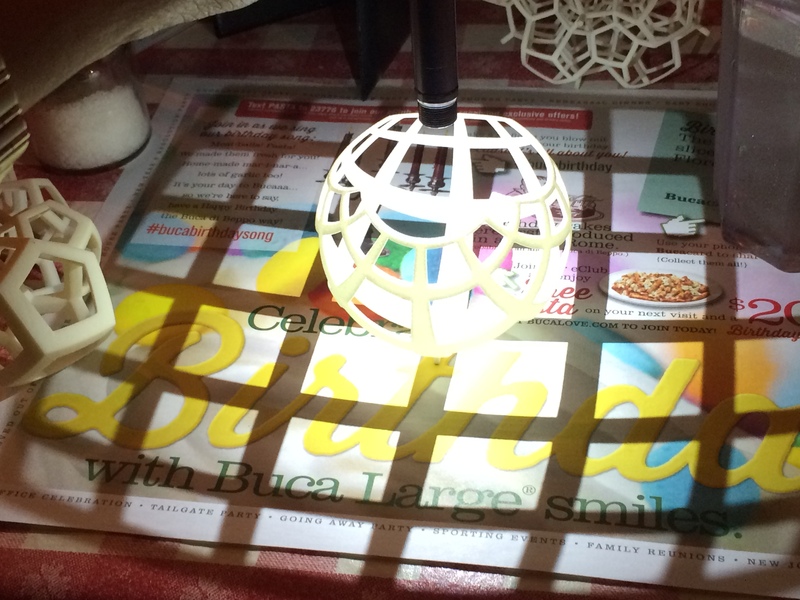 In this one, for example, by shining a light through the orb, a grid pattern is projected on the surface below. It was pretty funny to see all of us at the table playing with all of these objects and looking totally amazed. Anyway, GDC was great. I got a big dose of inspiration, and am ready to continue tackling Manifold Garden. 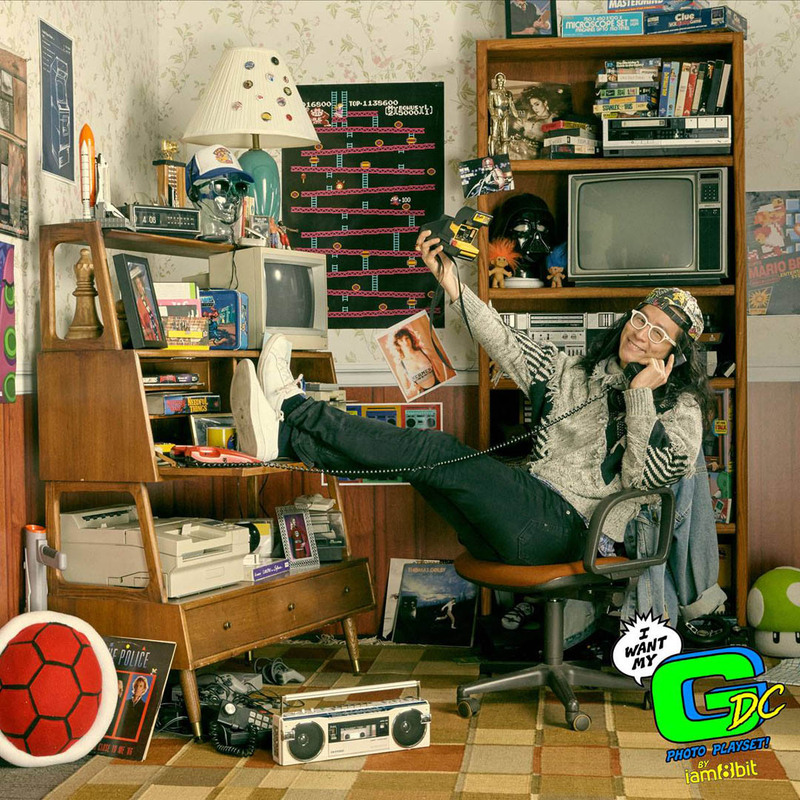 Oh, and here’s a picture of me taken at the iam8bit 80′s booth. I stopped by on the last day while it was closing down, and Jon from iam8bit convinced me to jump in last minute for a photo. So glad I did.